Educational games for a better world. Copyright © 2019 egoTeach, Inc..
One evening in Zanzibar last week, as we wended our way through Stone Town’s alleys in search of our new favorite restaurant (Lukmaan! ), we happened to see a lit doorway framing a room full of kids playing console games on several TVs. Excited to find some local gamers, we asked if they would be interested in seeing the educational games we’ve been making for young children. They said yes, and invited us to come back the next evening! The following evening, after a long day snorkeling from our new friend Ignacio’s boat at the tiny Nakupenda sandbar and Changu Island, we set out with a backpack full of tablets and our stomachs full of butterflies: would they discover the goals of the games without instructions, as we hoped younger, non-gamer children would? As avid gamers, would they find our offerings too simple and boring? Fortune smiled on us, and as it turned out they quickly figured out both the dynamics (tapping and dragging the appropriate elements), as well as the goals, based on the immediate and consistent auditory and visual feedback used across all games. 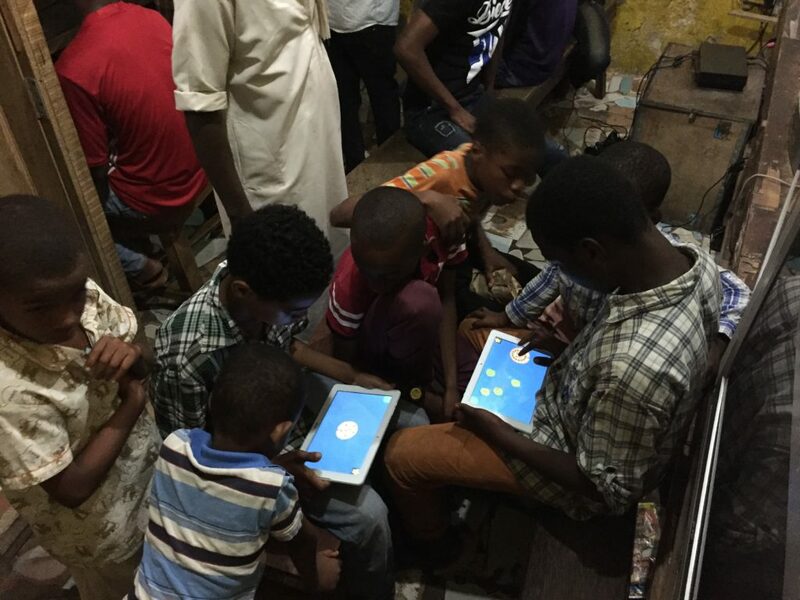 Moreover, even though many of these kids were older than our target age group (5-9), and had hit games from major game studios literally in front of them, they eagerly passed around the tablets, playing our games for half an hour. Circled around with heads together, the clusters around each tablet navigated from game to game, exploring each one for a few minutes before deciding to explore another, and finally switching back to earlier games as the tablet were passed around. Grinning at each other and high-fiving, it felt so good to see our hard work designing and implementing the games result in such engagement and learning–not of the content in this case, I think, but of the games themselves! Wending our way down an alley in Zanzibar one evening, we happened upon a gaming cafe (see the PS2 in the background?). We came back the next evening and asked if they wanted to try some games we were making, and were blown away by their keen interest. Stay tuned for the saga of our ongoing study in Dar es Salaam!